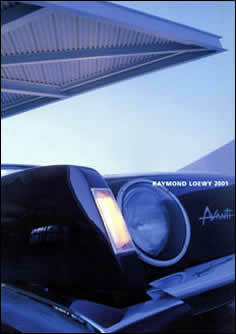 March, 2001 was the 40th anniversary of Raymond Loewy's design of the Avanti. The Montana St. Martin Gallery in Palm Springs, California marked the event with a nine day exhibit of automobiles, objects, and sketches Loewy described his style, force, and power with the words, "I always believed two and two made twenty-two." 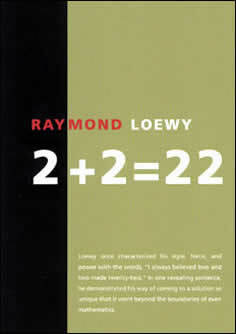 In one revealing sentence he demonstrated his way of finding a solution so unique that it even transcends the boundaries of mathematics. Design by Williams and House and photographs by David Glomb. 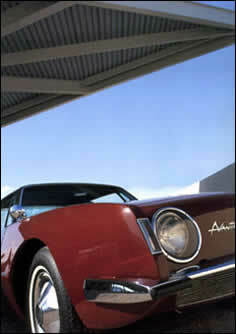 March 2001 marks the 40th anniversary of Raymond Loewy's design of the Avanti automobile in Palm Springs, California. This presents an opportune time to celebrate this extraordinary designer's influence on contemporary design. The Montana St. Martin Gallery featured a nine day special exhibit of automobiles, objects and sketches assuring Loewy's indelible stamp on American culture and his lifetime contribution to worldwide industrial design. 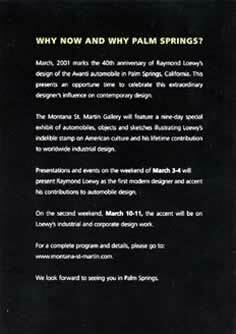 Presentations and events on the weekend of March 3-4 presented Raymond Loewy as the first modern designer and accent his contributions to automotive design.